Why turmeric? As I mentioned in my post about anti-cancer foods, turmeric is a super powerful anti-inflammatory and has been shown to decrease tumour growth in lab tests. 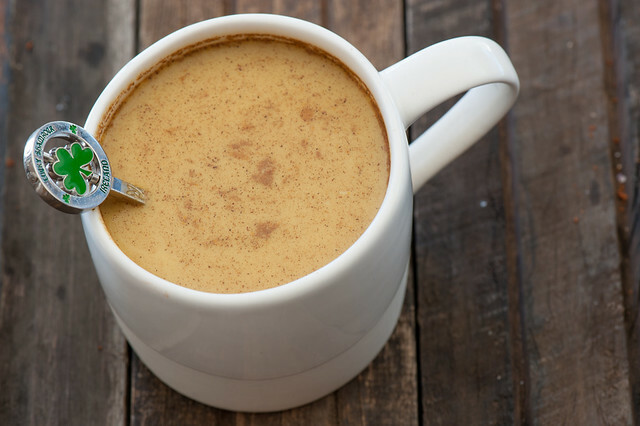 A hot cup of something spicy and slightly sweet is just the thing to ward off sugar cravings. Or when you feel like a treat that isn’t going to way you down and may actually do some good! 1. Make the tea ‘mix’ by combining the cinnamon, turmeric, stevia and ginger (if using) in a jar or other airtight container. Keeps in the pantry for months. 2. To make your ‘tea’ place 1-2 teaspoons of the mix in a cup. Top with hot water and a splash of milk or cream. Relax and enjoy! dairy-free – use your favourite nut milk instead. richer – instead of using boiling water use hot milk. no stevia? – replace the stevia in the mix with sugar OR skip it and serve the tea with 1-2 teaspoons of honey stirred though after adding the milk. fresh or dried stevia – skip the granulated stevia and add a few leaves to your cup when making the tea. Is sugar something you struggle with? I’d love to hear about it in the comments below.